(left) Bathymetry of the East Pacific Rise (EPR) based on data compilation and archiving enabled by the Ridge 2000 Data Portal at the Marine Geoscience Data System (MGDS) (http://www.marine-geo.org/index.php) [Carbotte et al., 2004; Ryan et al., 2009]. 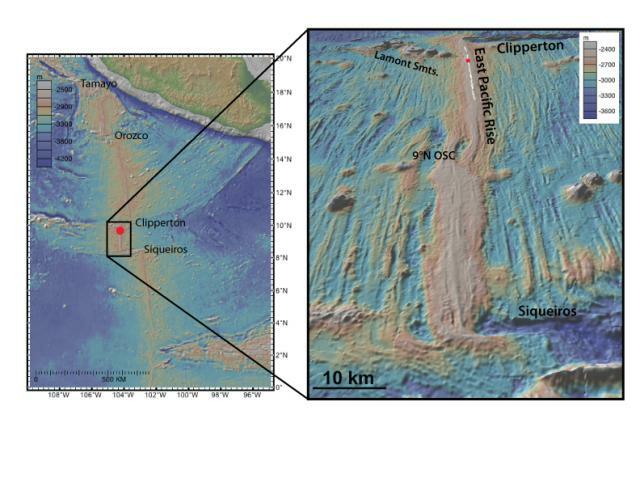 (right) Perspective image of multibeam bathymetry for the EPR 2nd order segment between Clipperton and Siqueiros transforms. EPR ISS focused study area near 9&deg50’N shown by red dot. Black line shows the location of the axial summit trough [Soule et al., 2009] where most of the hydrothermal vents and biological communities are located. Image created with GeoMapApp.